Click For Otter River And Mountain Sports Otter Sports is the Inland Northwest's premier retailer of whitewater and recreational canoes and kayaks. Being a family owned small business, cost was a large concern, but high image, functionality, and the ability to edit their content easily 24 hours a day was also very important. After meeting with the owners, Jason and Kira, we determined they needed our Product Catalog Module to list their products, our Shopping Cart Module to take online orders, our Content/News Module for managing content online, our News Letter services for their email marketing campaign, our Bios Module to feature their staff and professional kayak team, our Events Calendar Module to remind customers of upcoming classes and store sales, our Photo Gallery Module to show award winning photos of regional kayakers, our E-Guide Module to list regional kayaking spots and directions to get to them, our Classified Ads Module to have the community post "Wanted" and "For Sale" goods, our Chat Module to create recurring visits from the community interested in chatting back and forth, our FAQ's Module to post frequently answered questions about products or manufacturers, our Product Reviews Module to post the community's reviews about products, our Credit Card Verification Module to verify, authorize, and batch credit card transactions online, and our E-Mail Hosting Module to stay in contact with suppliers and customers via a web browser or email program from anywhere in the world. After our final price was one third of what they were expecting, and two years of great online success, they are still exuberant about our modules and most importantly our service. Click For AFCO Distribution AFCO Distribution is a wholesale distribution company located in Spokane, WA serving over 400 feed and pet supply retailers in the 6 northwest states of Washington, Oregon, Idaho, Montana, Utah, and Wyoming. 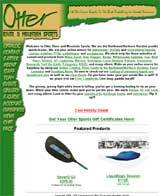 When we met with Jay and Lloyd they told us they already had a product catalog and shopping cart hosted by another company. Sure we were disappointed they wouldn't be able to make use of our Product Catalog and Shopping Cart Modules, but that wasn't going to stop us from helping them with their dilemma. Their catalog and shopping cart company wasn't able to host their e-mail or other pages to their web site, so they needed a site to provide some basic company information, and a link to their current online catalog. Our Content/News Module was a perfect solution for this problem. Lloyd also wanted to link off to some of his suppliers, again another problem solved. This time we used our Links Module so Lloyd could easily add, edit, remove, and even track the clicks the links received. With a distribution company as large as AFCO, you'd better believe they have many locations and suppliers. Naturally we provided our E-Mail Hosting Module to tie all of their locations and employees together, and give them a way to more efficiently communicate with their suppliers and customers. 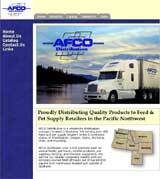 So visit AFCO Distribution today and see what they can do for you. Click For Bella Terra Garden Homes Bella Terra is a unique, 15-acre, master-planned, gated community on Spokane's South Hill, offering maintenance-free living in a spectacular garden setting with ponds and waterfalls. Click For Koerner Furniture Koerner Furniture is a family owned and operated furniture retailer, with stores in both Spokane and Coeur D'Alene. For 22 years Koerner has worked hard to maintain a high level of integrity, customer satisfaction, and image. This hard work has earned them the rank of #1 Furniture Store In North Idaho. When we met Barbara and Tim Koerner, we knew that we would have to work just as hard as we normally do to produce not only a top notch web site, but also to stay on top of their ever changing selection of furniture. Because they didn't have a need for a solution as elaborate as our Product Catalog Module, we recommended they use our Photo Gallery Module to showcase their furniture selection, our Content/News Module for managing their various text content, and our Links Module for providing links to their manufacturers. Because Barbara and Tim were working so hard on maintaining their high level of customer satisfaction, they made use of our data entry services to quickly and cost effectively load product photos, and information. If you are looking for quality furniture, at affordable prices and demand integrity and a high level of customer satisfaction, visit a Koerner Furniture location near you, or visit them on the web.